There is no link between tax rates and competitiveness! The Netherlands just joined the race to the bottom in corporate tax. Repeating the mantra that lower tax is good for the investment climate and necessary to remain competitive, the new government cheerfully leaked that it will reduce the rate from 25% to 21%. Let’s hope that other economic policies of this new government have a better foundation! For that mantra is a myth. The facts show that corporate taxes are irrelevant for a country’s competitiveness. Many people would acknowledge that low taxes are merely one factor that make a country attractive, alongside many others. Yet even that is not the reality. Surprisingly, current tax rates on profits, or indeed the higher rates from a decade ago, do not matter at all. The graph that follows below leaves no doubt about this. For some countries, lowering tax rates might seem a desperate move to make up for something else. The UK’s announcement to cut the rate to 17% is linked to Brexit, but it won’t stop firms from moving abroad. Hungary, which just adopted a rock-bottom 9%, is still out of grace because of its political course. And the US plan to axe the federal corporate tax, from 35% down to 20% or 15%, accompanies increasing threats of a trade war that would cause a lot of trouble for business. Governments under pressure can do silly things. However, two months ago, Belgium made a radical move too. In the so-called “summer agreement”, the government coalition struck a sunny deal to slash the rate from 34% to 25% in 2021. Unlike the US plan, or the UK’s intentions for 2020, this is a concrete agreement supported by a political majority. The same goes for France and the Netherlands. For such nations, the decision to reduce corporate tax can only be explained by a sincere, deeply held conviction that it is good for a country’s competitiveness. Or, at the very least, that a country has to follow suit when its neighbours are lowering their taxes. It is time, therefore, to address these myths head on. 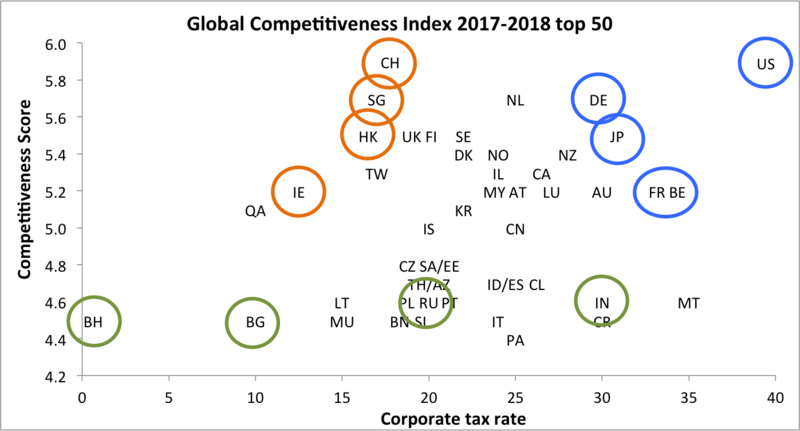 To analyse the relationship between tax rates and competitiveness, the graph below shows the top 50 countries in the Global Competitiveness Index. This index is constructed by the World Economic Forum, where there’s no lack of insight about what makes an economy competitive. The countries are shown by their Internet codes, for example DE is Germany and CH is Switzerland. The higher a position of a country in the graph, the higher the competitiveness score. The horizontal axis shows the total corporate tax rate, from zero-tax Bahrein on the left to a 40% average rate for the US on the right. The orange circles mark some of the highly competitive discounters: Switzerland, Singapore, Hong Kong and Ireland. These are often mentioned as evidence that low tax and a good investment clime go hand in hand. However, now look at the blue circles. These are notorious high-tax countries: the US, Germany, Japan, Belgium and France. Their competitiveness scores match strikingly with those of the low-tax group! Thus, countries with tax rates 15% or more apart offer an equally attractive investment climate. The green circles are even more stunning. They mark four countries in the top 50’s lower ranks with similar competitiveness scores: Bahrein, Bulgaria, Russia and India. The tax rates of these countries, by contrast, are very different: exactly 0%, 10%, 20% and 30%. Of course, tax rates do matter. Yet the graph clearly shows that they are irrelevant for a country’s overall investment climate. Note that the Global Competitiveness Index does take into account a country’s total tax rate and the effect of taxation on investments and employment. For a few countries, such as Argentina, the latest World Economic Forum executives survey even identified tax rates as a large problem for doing business, before political instability and bureaucracy. For other countries, including the Netherlands, the survey shows that tax rates are hardly a concern. The index also gives due weight to fundamental institutions, such as enforcement of property rights, infrastructure, and macro-economic stability. Moreover, it considers the efficiency and sophistication of the business environment, looking for example at the quality of education, functioning of labour markets, R&D spending, and market size. All of these factors must be taken into account. Perhaps surprisingly, the truth is that there is no need for any country to copy the misguided policy choices of its neighbours. It is in a country’s own interest to refuse joining the race to the bottom on corporate tax, and instead focus on those competitiveness factors that really matter. 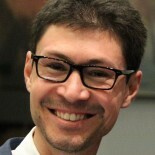 Occasionally, for a country like Argentina, those factors may include taxes. Far more often, they do not. This entry was posted on October 6, 2017 by fweyzig in English posts.